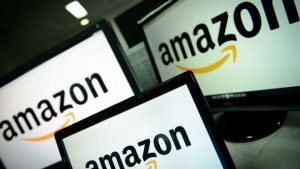 Amazon.com Inc. said on Thursday that sales had surged during the summer and that its profit sped past expectations, as shoppers flocked to promotions on its “Prime Day” and purchased groceries at its recently acquired Whole Foods Market chain of stores. Shares at the e-commerce giant were up over 7% in trading afterhours. Amazon has won business from its big box, older rivals through delivering almost any product to its customers at low prices, and many times faster than it would take to buy the goods from a brick and mortar location. Amazon acquired grocery store chain Whole Foods in August for just over $13.7 billion to help in delivering groceries to the doorstep of shoppers. The results at Amazon defied most expectations that it would be investing close to all earnings in new areas as it has during much of the past. The largest online retailer in the world said its net income grew to over $256 million equal to 52 cents a share during the quarter. Analysts were expecting income of 3 cents a share. One Wall Street analyst said Amazon has reached the point where it is able to sustain spending for growth and still have leftovers for its shareholders. The company’s summer marketing spectacle Prime Day has created a day of shopping similar to the holiday shopping season and helped it boost its sales. Revenue increased 34% to end the quarter at $43.7 billion including sales of $1.3 billion at Whole Foods, while analysts were expecting overall sales of $42.1 billion. For the first time, Amazon broke its sales out for its business of online retail and for physical bookstores as well as its Whole Foods stores. Revenue from online stores increased by 22% to over $26.4 billion, which is the fastest growth seen by Amazon in that segment for over one year. Key to success at Amazon has bene signing up more customers for its club Amazon Prime, which is its video streaming and fast shipping segment, whose members usually buy more from the online giant. Revenue from its subscription fees grew by 59% to over $2.4 billion. The Amazon Web Services or AWS, which handle computing and data for large companies, saw growth in profit margin compared to the quarter before, posting a rise in sales of almost 42% to end at $4.57 billion, which beat estimates of $4.52 billion.